450 former civil servants are on company boards, many in sectors they regulated while in government, raising questions of propriety and ethics. New Delhi: In a nearly four-decade career, Meleveetil Damodaran, 71, served in the finance ministry, was the chief of the state-run IDBI Bank and chairman of the market regulator Securities and Exchange Board of India (SEBI). He also served as chairman, Unit Trust of India from 2001 to 2004. Now, the former IAS officer of the Tripura-Manipur cadre serves as a non-executive member on the boards of corporate giants Hero MotoCorp, Tech Mahindra, L&T, CRISIL and Biocon. As SEBI chairman, Damodaran has regulated all these companies. Damodaran, however, isn’t the only retired bureaucrat and SEBI chief serving as an independent director on the boards of companies. U.K. Sinha, the second longest-serving SEBI chief (2011-2017) and former chairman and managing director of UTI Asset Management Company, was appointed on the board of Vedanta just after the one-year cooling off period that retired civil servants need to serve after demitting government office. Sinha, who drew Rs 4.82 lakh, is also on the board of Havells India Ltd, according to Prime Database. This was his remuneration as on 31 March, 2018. His predecessor C.B. Bhave serves on the boards of Avenue Supermarts and Vistaar Financial Services. He earned a total of Rs 52.68 lakh in 2017-18. 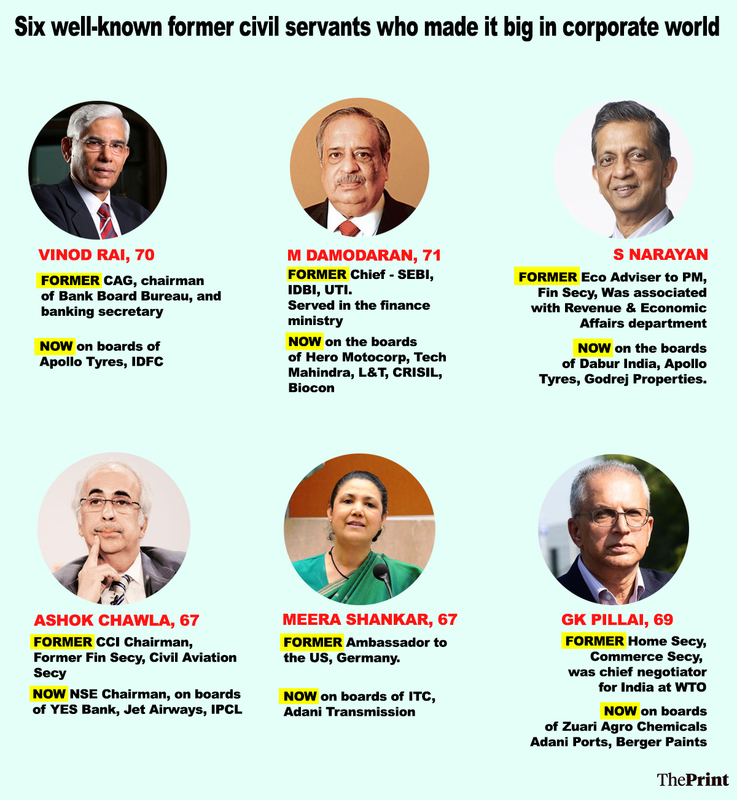 Damodaran, Sinha and Bhave are part of a growing number of former high-profile bureaucrats who are being employed as independent directors in corporate India —including in sectors they regulated or dealt with closely while in government —raising questions of propriety and ethics. Of the top 100 listed companies on the National Stock Exchange (NSE), as many as 60 have appointed former bureaucrats as independent directors on their boards, according to data from Prime Database, a top source of capital market information. In 2013, when the revamped Companies Act came into effect, 37 former bureaucrats were employed as independent directors in these top companies. The number, however, is just the tip of the iceberg as over 450 former civil servants are currently engaged on various other company boards in India. In March 2013, this number was about 400. The list includes some one-time high-profile bureaucrats such as former Comptroller and Auditor General of India (CAG) Vinod Rai, 70, who apart from heading the Committee of Administrators (COA) in the BCCI, is also on the boards of Apollo Tyres and IDFC, where he is a non-executive independent chairman. As CAG, Rai — whose compensation package was Rs 88.80 lakh in 2017-18 — held a constitutional position. S. Narayan, who was the economic adviser to the Prime Minister during NDA-1 and has also served as the finance secretary, is on the boards of Dabur India, Apollo Tyres and Godrej Properties. Narayan earned Rs 98.90 lakh in the previous financial year. The home secretary in the UPA government, G.K. Pillai, 69, who was India’s chief negotiator at the WTO when he was the commerce secretary, is on the boards of Zuari Agro Chemicals and Berger Paints. He is also serving as independent and non-executive director on the board of Adani Ports. Other prominent names include Pillai’s wife Sudha Pillai, G.C. Chaturvedi, Sumit Bose, Nirupama Rao, Adarsh Kishore, Meera Shankar and Rita Menon. A few former civil servants have joined companies in specific sectors that they regulated when in government. Former election commissioner Syed Nasim Ahmad Zaidi, for instance, joined the board of Jet Airways as a non-executive director in May. Zaidi was civil aviation secretary between 2010 and 2012 and the Director General of Civil Aviation (DGCA) before that. His colleague on the Jet board is NSE chairman Ashok Chawla, also a former civil servant, who served as civil aviation secretary as well as finance secretary. He was also later appointed the chairman of Competition Commission of India and was associated with several ministries. Chawla is now chairman of the board of Yes Bank, which is listed on NSE. Analysts say companies are turning to former bureaucrats to fill up these independent director positions as the Companies Act, 2013, mandates that firms should have at least 50 per cent non-executive directors on their boards. Independent directors can occupy one-third of the board in case the chairman is a non-executive director. The induction of former civil servants, analysts said, allows companies easy access to the power corridors in government and enhances their networking ability. 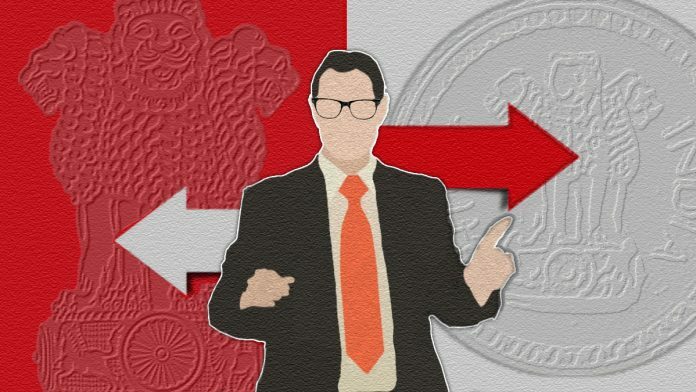 “They are clearly not appointed for their domain expertise…they are appointed by companies so that their voices can be heard in the power corridor,” said Prithvi Haldea, a member of the advisory board of the Association of Independent Directors of India and chairman of Prime Database. “Most companies prefer appointing former bureaucrats as this naturally adds weight to their set-up. While as per law there is no restriction on civil servants joining any company boards, this can lead to questions on ethical conflict of interest,” said Amarjit Chopra, former president of the Institute of Chartered Accountants of India (ICAI). Former finance secretary Ashok Jha, however, disagrees. He says it’s only natural for companies to turn to civil servants as they not only have domain knowledge but experience as well. “Many bureaucrats bring years of experience, domain knowledge and an understanding of the economy. It is therefore natural for companies to tap into this pool,” Jha, who is on multiple company boards, told ThePrint. Both Jha and Chawla have been named in a CBI chargesheet relating to the Aircel-Maxis bribery case. They are among the 12 individuals named in the chargesheet, which also includes former finance minister P. Chidambaram and his son Karti. “The government has a cooling-off period post retirement and it is only after that that an officer can accept directorship in any company. The cooling-off period is meant to take care of issues of conflict of interest,” he said. Pulak Ghosh, a professor at IIM-Bengaluru, too believes that there is “no harm” in the practice. “In case the former bureaucrats indulge in practices that are not appropriate, that should be taken up individually,” Ghosh said. For the bureaucrats, the posts are lucrative. Independent directors can draw a maximum sitting fee of Rs 1 lakh for attending board meetings and are entitled to out-of-pocket expenses and even a share of the net profit. For instance, Damodaran, the top-earning retired bureaucrat as per Prime Database, made Rs 3.49 crore in 2016-17 while in 2017-18 he earned Rs 2.26 crore. The former Indian ambassador to the US and Germany, Meera Shankar, who is on the boards of ITC and Adani Transmission, earned Rs 1.04 crore in 2016-17 and Rs 1.2 crore in 2017-18. Her husband Ajay Shankar, who retired as secretary, Department of Industrial Policy and Promotion (DIPP) too is currently on the board of L&T. S. Narayan earned Rs 1.03 crore in 2016-17 and Rs 98 lakh in 2017-18. A number of those defending the appointment of retired bureaucrats in corporate India cite the government’s “cooling-off” period. Rules mandate that retired government officials need a one-year “cooling-off period” before switching to the private sector. This is to ensure that there is no conflict of interest but until December 2015 the cooling-off period was two years. Civil servants can also seek an exemption on the cooling-off period. Nirupama Rao, the former foreign secretary who was also ambassador to the US, China and Sri Lanka, rejected the charges of conflict of interest. “I joined company boards from 2014, over two years after I had formally retired from the foreign service in July 2011. There is absolutely no conflict of interest here,” Rao said in a text message. “I had dealt with none of the companies concerned during my years in service,” she said. “This is something that happens even in the judicial system…you have a judge who frames a particular piece of legislature and then also deals with a case where the same is applicable, in such cases you need to apply your conscience and stay away…same goes for independent directors,” Salman Khurshid, Congress leader and former corporate affairs minister said. About 40 per cent of the retired civil servants who are currently serving as independent directors have been involved with the finance ministry. “The role of independent directors is well defined now as per law… It has been well thought out to rule out any discrepancy and conflict of interest… In fact, they are the ones to be held directly accountable and even taken to task in case anything goes wrong in the company,” said another former civil servant who is currently serving as an independent director. A senior official at ICICI Bank, which recently appointed former petroleum secretary G.C Chaturvedi to its board, said the practice was not new. “The bank has appointed Chaturvedi because of his vast experience,” the official said. Chaturvedi, was also an additional secretary in the department of financial services. While he was in the government, he was also on the boards of government-owned Life Insurance Corporation (LIC) besides several banks. As petroleum secretary, Chaturvedi implemented the process of gradually hiking diesel rates that finally led to a decontrolled regime. A spokesperson for Jet Airways said individual members or their backgrounds didn’t influence decisions of its board and committees. “Decisions in the board/committees are taken in accordance with corporate governance principles. Individual members or their backgrounds have no role in the unanimous decision of the board and its committees,” the spokesperson said. Besides Chawla and Zaidi, the Jet board also has Ranjan Mathai, the former foreign secretary who was the Indian High Commissioner to the United Kingdom. He was also the Indian ambassador of India to France among several other countries. Jha, Chawla and Rai served in the finance ministry around the same time. Independent directors are responsible for maintaining the credibility of companies and improving corporate governance while providing advice. But with the rise in the number for former bureaucrats becoming independent directors, the scanner is back on their role. Under present rules, there is no bar on age limit or specification of minimum qualifications for independent directors. And any independent director can simultaneously serve on six boards of listed entities. Last month, a government-appointed committee submitted a report on corporate governance and penal provisions under the Companies Act, 2013. The committee prescribed imposition of a cap on the remuneration of independent directors to improve transparency. In August, former Reserve Bank of India (RBI) governor Bimal Jalan, who was also finance secretary, quit from HDFC group’s board just ahead of its annual general meeting. The Institutional Shareholder Services (ISS) – a proxy firm—asked the shareholders to vote against the former civil servant as he attended less than 75 per cent of the meetings. “There is a cooling-off period and this is to ensure that there is no misuse of position or power. However, there could be one or two cases where discrepancies have come up but to paint all of them with the same brush is not fair,” corporate affairs minister P.P. Choudhary told ThePrint. At present, there is a cap on the sitting fee — it cannot exceed Rs 1 lakh per board meeting – but there is no cap on the commission on profits. The committee has underlined that there must be a “cap on independent director’s remuneration in terms of percentage of income in order to prevent any material pecuniary relationship, which could impair their independence on the board of the company”. The Central government is also keen on creating a database of independent directors. In January, minister Chaudhary said that independent directors must keenly look into issues of corporate governance, flagging the issue of related-party transactions. These transactions refer to companies that either have or may in the future have business relationships. It came under the scanner as independent directors are on the boards of various companies. “In the best interest of a company, the issue of conflict of interest in related party transactions needs to be looked at judiciously. Independent directors have to exercise special care while looking into such related-party transactions,” he said. “They are supposed to be totally independent in nature so that they can raise their objections at any given point if they so feel but in reality, none of the independent directors are truly independent,” said Haldea. “Either they have influence or they get remuneration that often deters them from being independent and that is one reason companies often fail to maintain the required standards,” he added. R.P.N. Singh, Congress leader and former minister of state in the ministry of corporate affairs, however, told ThePrint that all board members, including independent directors, are now accountable and liable under the new companies act. “The independent directors and all other board members have fixed liabilities, so if someone is not doing her duty, she is answerable and accountable. As far as the issue of conflict of interest goes, it must be investigated if there are discrepancies but this should only be on a case-to-case basis,” said Singh. “We cannot generalise and conclude (that appointing former bureaucrats will automatically lead to conflict of interest)… That will be extremely unfair,” Singh added. Is there a dearth of talent in our country? Why engage IAS, IFS and other Civil Servants retired or resigned from a government or semi government job? They must have got substantial superannuation benefits and get monthly pension. The pension also gets enhanced at periodic intervals on account of hike in dearness allowance / relief to compensate cost of living and up gradation of pension at periodic intervals along with wage revision of working employees. 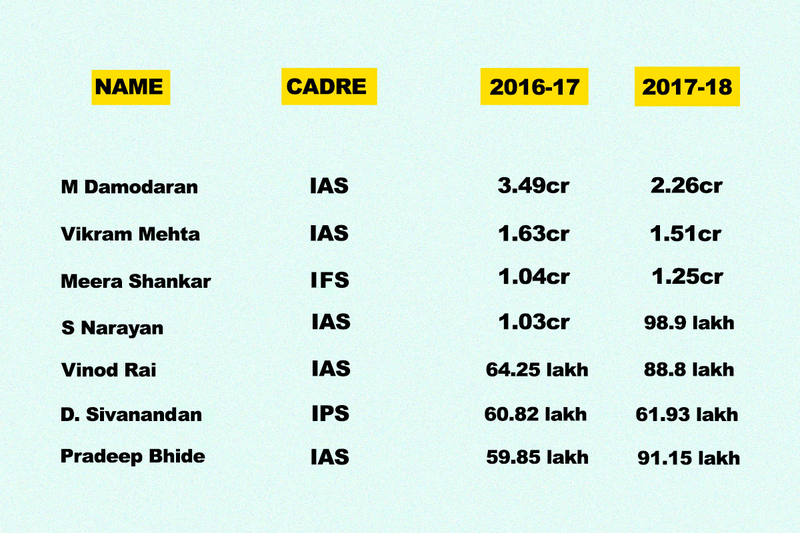 Why then these bureaucrats’ income be supplemented with packages running into lakhs and crores per annum? Why swell their purses, their personal wealth? All said and done, all with the exception of five to ten percent (try to) influence directly or indirectly the current incumbents to the seat of powers to get all kinds of ‘jobs’ done, by ‘fair or unfair’ means. All these bigwigs should be, immediately, asked to relinquish their positions, posts. There are hundreds underemployed / unemployed talented persons in all fields (finance, commerce) of activities in our country. All corporate and other sector should engage “new blood” to manage important positions in their organisations through a proper process of selection. Those with some minimum qualification, knowledge and experience could be inducted into board-level posts. All could be hired at half or less than half the cost incurred presently on ex- civil servants. It is better that all the retired and all tho senior citizens (60 and above) financially strong (who are in the income tax slab of 30%) engage themselves in social service. If this exhortation is carried out in letter and spirit, it would definitely help to solve unemployment problem to a great extent. Dr S Jaishankar, who served for three years as Foreign Secretary, is now with Tata Sons. 2. There is a lot of calibre and relevant knowledge and experience that individuals who have served at senior levels in the government, especially in economic ministries, possess. It can prove valuable to the corporate sector, if the intention is not merely to use them for networking. 3. The most difficult issue to resolve is how “ independent “ Independent Directors are. Like professional auditors, they owe their appointment and continuance to the management. In practice, not textbook theory, they are unlikely to tread on corns, ICICI Bank being the latest example. This is called abject surrender of the country before the powerful coterie of bureaucrats. Dr Vijay Kelkar then Petroleum Secretary asked the accompanying chairman of the Gas Authority of India (Gail) that the person sitting opposite him, on behalf of the Reliance, seemed to be a familiar one. The Gail Chairman lost no time in telling the Petroleum Secretary that yes, he was the same person who a few years ago had signed an agreement with the Reliance as Executive Director of the Gail. Another interesting sordid development that the bureaucrats and police officers in the country in inconvenient posting or cadres, in most of the cases the North-eastern states hardly serve their cadre and manage to mark their inning with the government by securing deputation to the Center, autonomous bodies or the study leave for studying in prestigious universities abroad. The steel frame of India has rusted.